Turkey and the EU: The end of the affair? The European Parliament will vote this week on whether to suspend Turkey's talks on joining the EU, and the Turkish government is giving a good impression of looking the other way. "Turkey should feel relaxed about the EU and not be fixated about joining it," President Recep Tayyip Erdogan said at the weekend. Instead he repeated his idea of joining Russia and China in the Eurasian security group Shanghai Co-operation Organisation. "Why shouldn't Turkey be in the Shanghai 5?" he suggested. Turkey's long journey towards the European Union has never been a bed of roses; rather a bumpy road of twists and turns. Ever since the 1960s it has aspired to be part of the bloc, officially applying to become a member in 1987. It was not until 2005 that accession talks actually started. Only one of the 35 so-called chapters necessary to complete the negotiations has been closed. And that indeed could be all that Turkey achieves on its path towards the EU. A debate will start in the European Parliament on Tuesday, and then will come a vote later in the week. "I guess this text will call on the temporary freezing of the accession talks," said Kati Piri, the rapporteur for Turkey at the European Parliament (EP). "We do not think there is enough credibility to continue the talks on EU membership under the current circumstances. We cannot go on as if nothing has happened," she told the BBC. Brussels has been overtly critical of the Turkish government's record on democratic rights and freedoms, especially after the purge that followed the failed coup of 15 July. More than 110,000 people have been sacked or suspended since the coup plot and some 36,000 arrested - including 10 lawmakers from the second biggest opposition party in parliament, and dozens of journalists. Media outlets have also been shut down. How do Turks in Europe see Erdogan? "It is the credibility of the EU's accession process which is now at stake. We are not saying we should shut the door to Turkey, but we are reacting to the fact that the Turkish government with its actions is actually shutting the door on the EU," said Kati Piri. "Turkey has to normalise before we can continue the accession talks. The key lies in the hands of the government in Ankara, not in the hands of the EP," she argued. Although the European Parliament vote will not be binding, it might still have serious political effects on Turkey's EU bid. 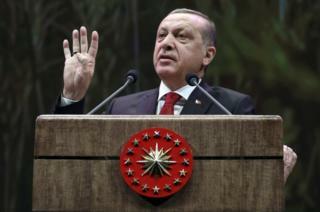 "I do not think Turkey's bid will legally be suspended unless the death penalty is reinstated. But member states cannot overlook the decision of the European Parliament," says Cengiz Aktar, a professor of international relations in Turkey. But, he argues, it would mean no more chapters in Turkey's accession talks. "So we are speaking of a de facto end to Turkey's EU bid." President Erdogan urged Turks to be patient until the end of the year over relations with the EU and said a referendum could be held on the country's EU membership in 2017. "If such a referendum is held, considering the government's influence over domestic media and thus the public opinion, the result could well be similar to Brexit. Turks might say 'No' to the EU," Cengiz Aktar says. All this leaves one serious question for Turkey's future relationship with the EU. What will happen to the migrant deal? In March, Turkey agreed to curb the flow of migrants and refugees to Greece in return for several incentives including EU cash assistance for Syrian refugees living in Turkey and visa-free travel for Turkish citizens within the Schengen passport free area. "There is a risk that the whole migrant deal could collapse by the end of the year," says Murat Seyrek, a senior policy adviser at the Brussels based think tank, European Foundation for Democracy. And, if the migrant deal fails, he warns there could be a security risk too as the jihadist group Islamic State continues to lose territory and power. "Foreign fighters in Syria and Iraq might come back to Europe through Turkey. Turkey and the EU need to co-operate," he says.